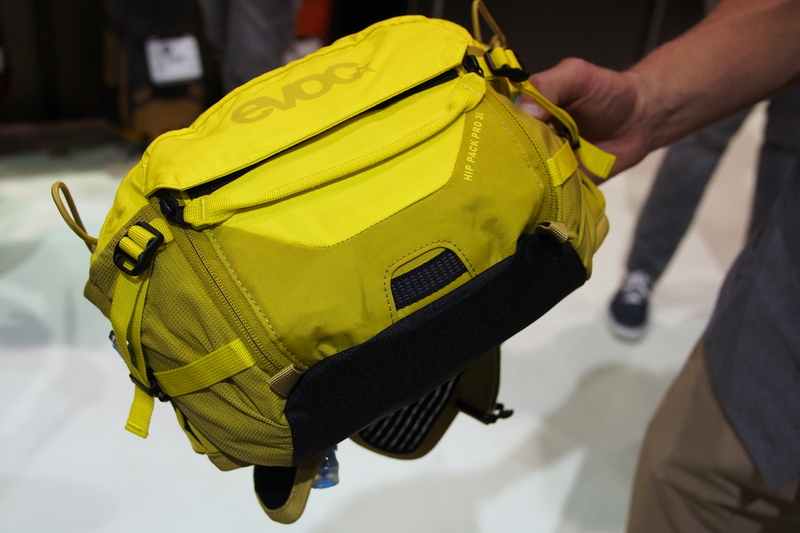 One of the most interesting accessories we saw at Interbike is this new hip pack from Evoc Hip Pack Pro 3L. 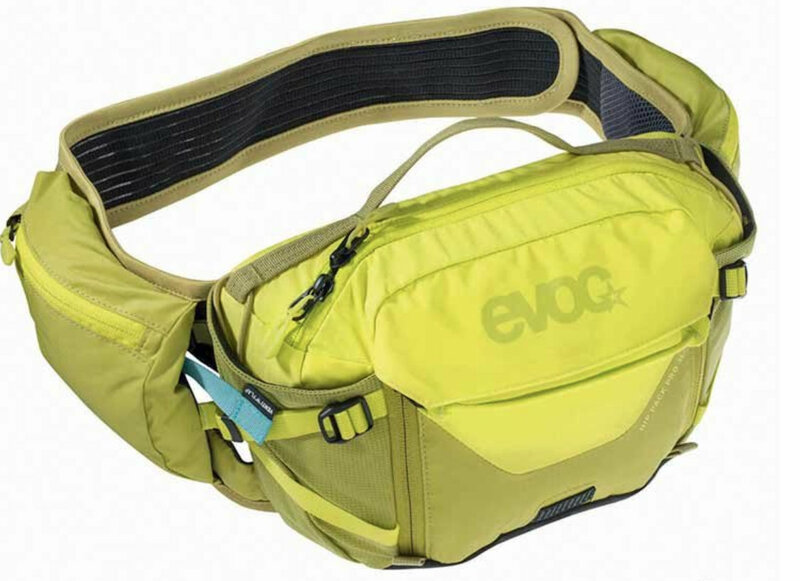 Expert in backpacks, Evoc has built a couple hip packs already and has learned a few things along the way. This new release incorporates everything they’ve learned to date. It may be the goldilocks hip pack. What caught our attention first is the overlapping elastic strap system. These are two wide, ventilated straps that have a good stretch in them. 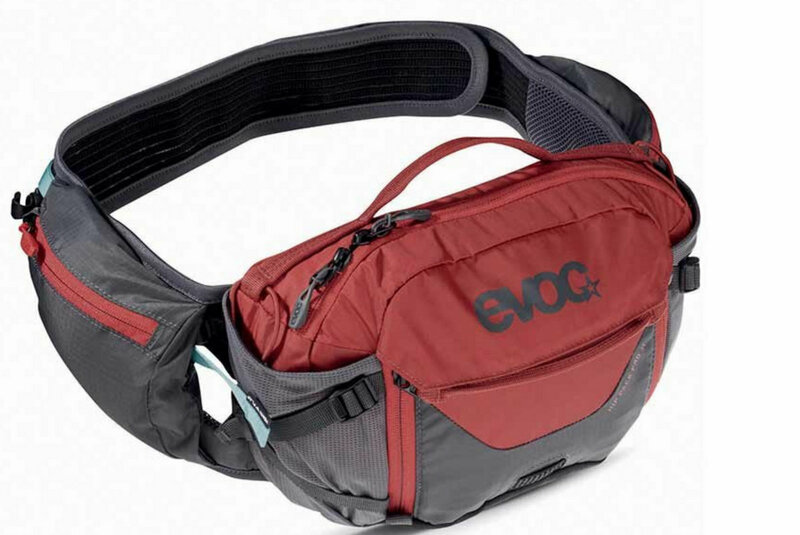 We have found from other packs that this is key to a comfortable hip pack. 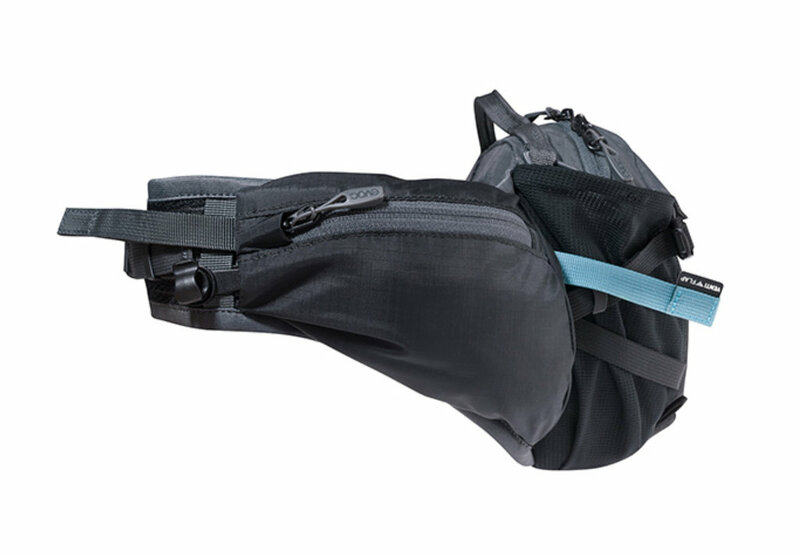 Since a hip pack has no shoulder stabilizing straps, it is key that the waist strap is secure to keep the pack in place during aggressive descents. But too tight and it results in an uncomfortable fit, especially during heavy breathing, climbing efforts. Packs with stretch allow a good, conforming fit. The shape of the straps and pack is contoured to conform to one’s hips. The shape of the pack is essential too with straps that point up at the sides and a pack that sits low and rests on the hip. Wide straps are key and a breathable material on anything that touches the body is good. The audience for hip packs, after all, is the rider that values ventilation highly. Two bottles are conveniently accomodated. 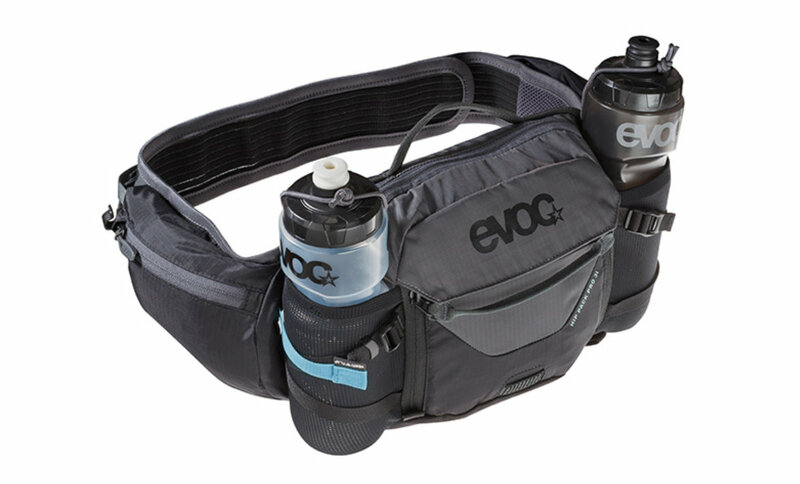 A piece of genius product definition that Evoc called for is a pack that can hold two water bottles and a bladder. 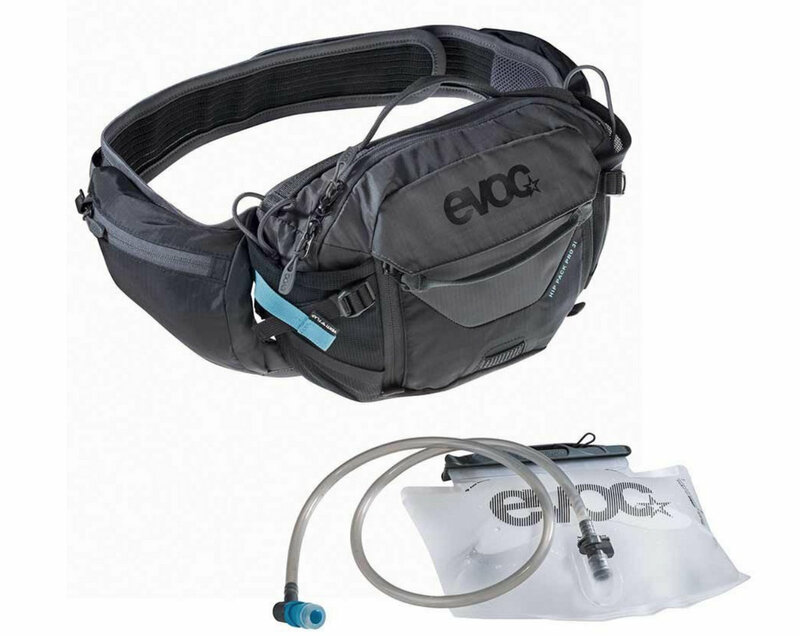 The bladder is 1.5L and it is optional as the pack can be purchased in two configurations. 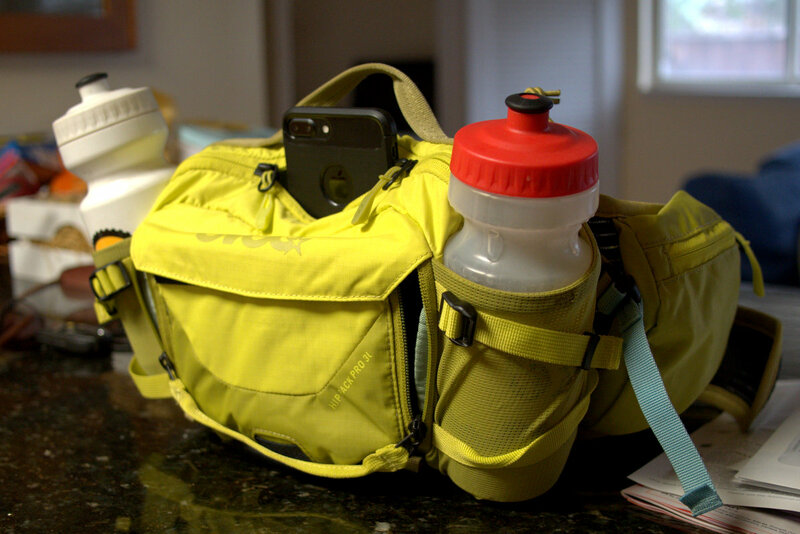 The two water bottle holders are stealthy when not in use and symmetrical for balanced water transport. The system can be used with two tall water bottles and the 1.5L bladder. Here’s the black with the optional bladder. Colors are good and Evoc supplies a black, subtle red and hi-visible yellow to address the market. Construction is typical first-rate Evoc. And to take comfort a step further, Evoc designed a system called Ventiflap. It involves two pull straps on each side that loosen the fit by about an inch on each side. Pull them backward and the pack hangs loose and comfortable for climbing, improving ventilation. Pull the straps forward and the pack is secure for aggressive descending. 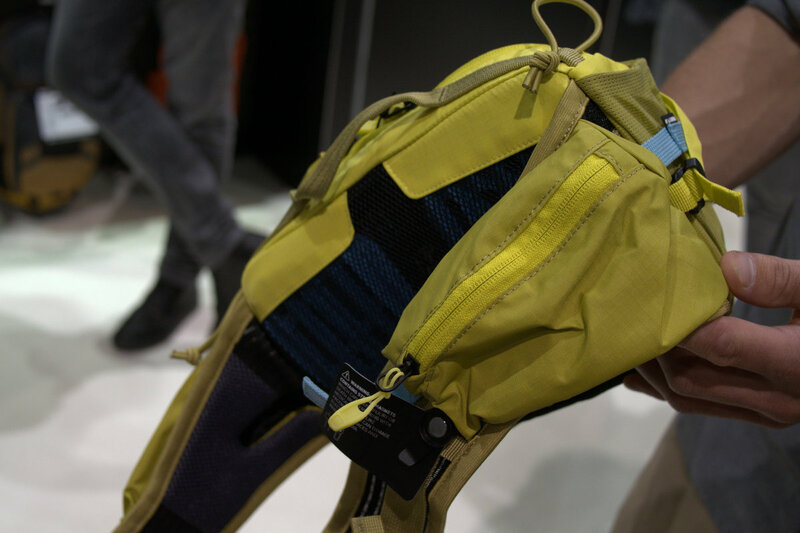 We have a couple rides on our pack and it may be the new benchmark for hip packs. A full review will be posted shortly. Red is a sublime tint. Comes in yellow. When no bottles are used, bottle holders don’t call attention to themselves.